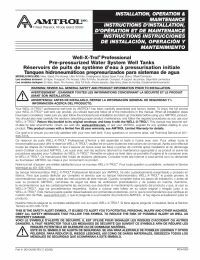 The TFP1 Tank Installation Package for Well-X-Trol Tanks are supplied un-assembled, providing the opportunity to combine any of the optional devices. When assembling the components, use a quality thread sealant or Teflon tape. Use a non-Teflon based thread sealant when assembling plastic to metal connections or plastic to plastic connections. The TFP1 is compatible with the Well-X-Trol WX-201, WX-202, WX-203.